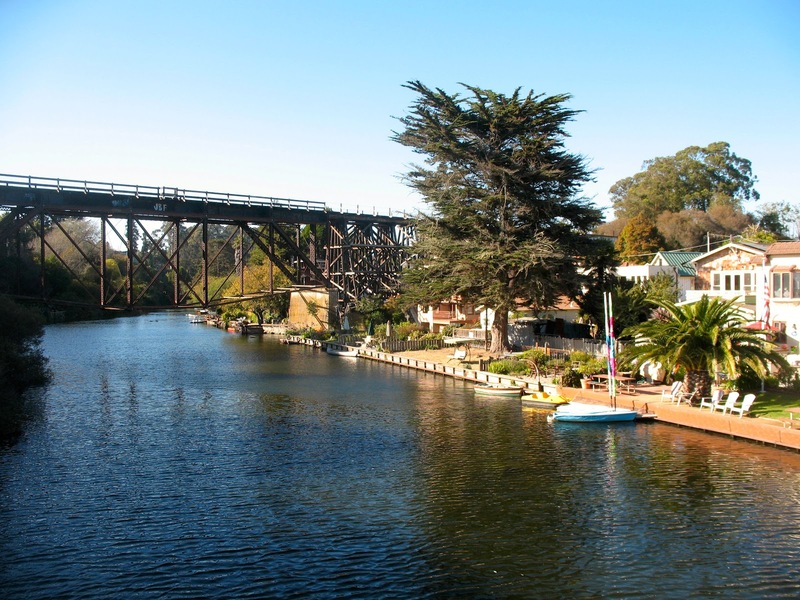 Bridges are an essential part of any railroad and nowhere in Santa Cruz County is there a bridge more iconic than the Soquel Creek bridge that towers over Capitola Village. Two bridges have spanned this 669-foot-long gulch and both were—and the latter remains—popular subjects for photographers. The first bridge was constructed by Tom Carter under contract for the Santa Cruz Railroad in summer 1874. The bridge was a fairly standard design for a long span such as this. 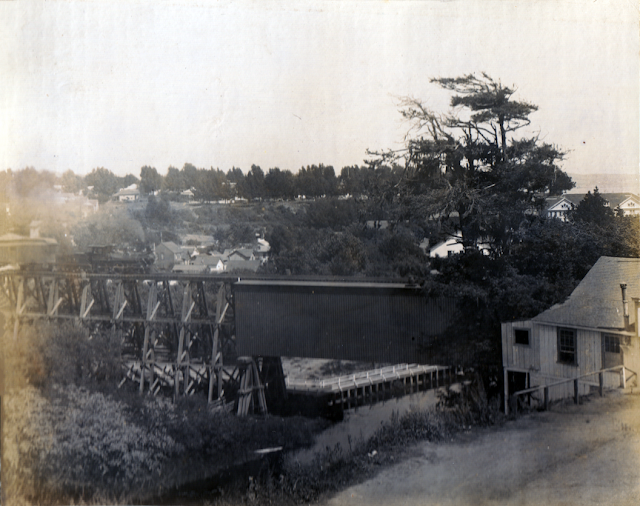 More than half of the length, from Depot Hill to Soquel Creek, was composed of a simple redwood open-deck trestle. A similar, albeit much shorter, span connected the other bank of Soquel Creek to the west bank. 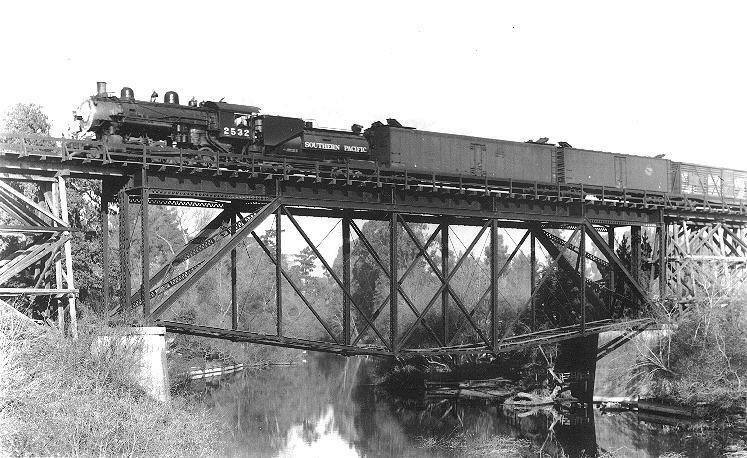 Over the creek itself, a roughly 200-foot-long redwood double-intersecting Warren truss ensured trains travelled safely and securely over the creek. No piers were required to support the truss span, but dense redwood piers were built on either side of the span to keep the bridge aloft. This narrow-gauge bridge underwent a heavy remodeling in 1883-1884 to convert it for use by standard-gauge trains after the Southern Pacific Railroad purchased the Santa Cruz Railroad in 1882. Whether these changes were highly visible is unknown, but Southern Pacific did at this time relocate Soquel station from the western end of the bridge to Depot Hill, changing its name to Capitola in the process. At some point in the 1890s, the truss span was also enclosed, probably to protect it from the corrosive sea spray. 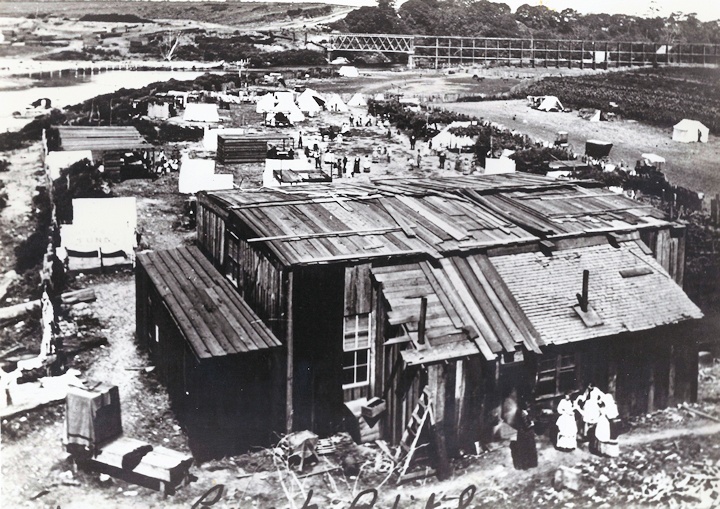 The second and current bridge over Soquel Creek was built in a number of waves as the community beneath the bridge transitioned from a seasonal resort to a year-round town. The oldest sections of this bridge closely resembled the original bridge, including a 335-foot-long redwood trestle from Depot Hill and a 100-foot-long trestle extending to the west bank. Over the creek itself, the old wooden truss was replaced with a 150-foot-long open-deck, wrought iron, truncated, upside-down curved chord Pratt truss span that was unique among the bridges along the Central Coast. To support this truss, two large concrete piers were installed on either side of the creek. 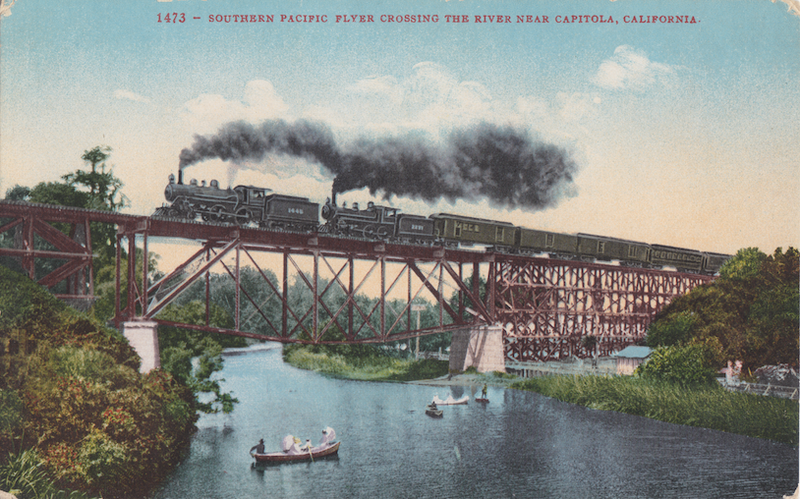 This truss was not original to Soquel Creek—Southern Pacific had repurposed it from elsewhere in its system and sawed off portions on each end resulting in its unique design. At some point, probably in the 1930s, the trestle span over Capitola Avenue was bisected to allow for the insertion of a 120-foot-long prefabricated open-deck steel plate girder span, which was supported by heavily-reinforced trestlework on either side. 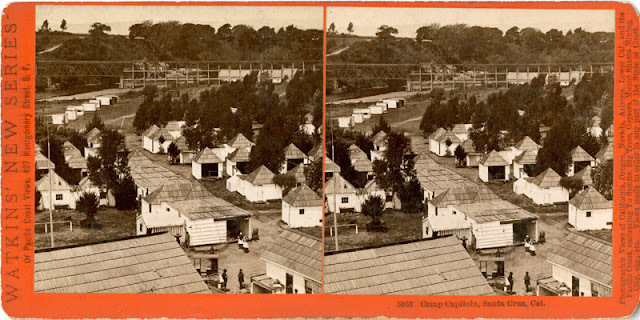 This allowed automobiles to more comfortably pass under the bridge and into Camp Capitola. In 1971, the original plate girder span over Capitola Avenue was replaced with a three-part concrete ballast deck span, which better protects cars passing underneath from train debris. On the opposite side of the bridge, over Wharf Road, a similar 60-foot-long concrete ballast deck span was installed to provide better clearance for cars and a safer passage beneath the bridge. This latter span replaced the wood abutment originally found on the west side of the bridge and also replaced the majority of the trestlework from the truss. The current bridge is, unfortunately, no longer fit to support fully-laden railroads operating at branch line speeds and is not designed nor upgradable for use as a pedestrian corridor. As such, it will undoubtedly undergo a partial replacement within the coming years. An engineering evaluation and rehabilitation report from 2012 estimated a cost of roughly $1.2 million to rehabilitate and rebuild the bridge for regular use, although the structure will have to be replaced within 20-30 years regardless. Use of the bridge by pedestrians is not advised and technically illegal, although dozens of people cross the bridge on foot each day. The bridge, as well as the rest of the right-of-way, was purchased by Santa Cruz County in 2012 and is under the jurisdiction of the Santa Cruz County Regional Transportation Commission. MacGregor, Bruce, and Richard Truesdale. A Centennial: South Pacific Coast. Boulder, CO: Pruett Publishing, 1982. Santa Cruz County Regional Transportation Commission. "Santa Cruz Branch Rail Line: Alignment and Bridge Evaluation & Repair / Rehabilitation or Replacement Recommendation Report." Compiled by Patterson & Associates, August 12, 2012. Harriman coaches from San Francisco commuter service, a dining car from the Sunset Limited, and last but not least, the "Ferroequinologist", an old open end observation car. I saw it again coming up the grade out of Santa Cruz and on it's arrival at Henry Cowell Park. A very impressive sight! It would also be of interest if the 1930-1959, and the 1960-1965, history of the Big Trees location could be recalled and understood. The club house, 'pioneer town', suspension bridge, cottages, landmark trees - one at a time, or all at once - how were they abandoned? Why would the Suntan bother with this stop in 1958? - and, of course, the Big Trees Station page is a better spot for any reply.